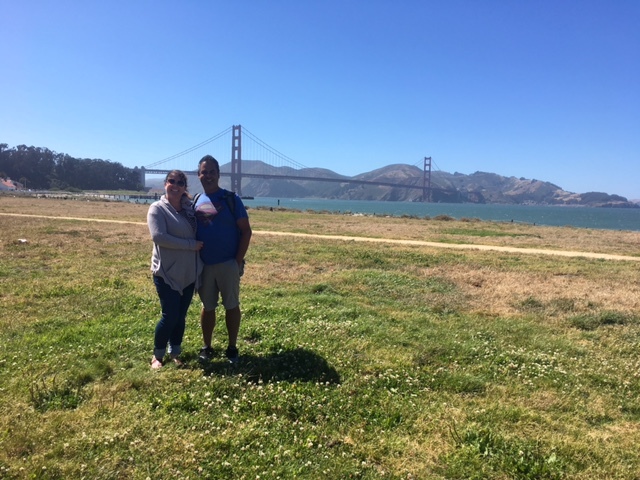 Trina's page of Blogginess: Susie and Mike in SF!! Susie and Mike came for a visit from Indianapolis today!!! Susie and I have been friends since 1991. I was so happy to spend the day with her and her wonderful husband, Mike this afternoon. They are lovers of dogs, so Wallace and I picked them up from BART, gave them a tour of our home, had lunch with them on Chestnut Street then took them to Crissy Field!! It was super windy on the beach at Crissy Field, but it mellowed by the time we walked to Fort Point.